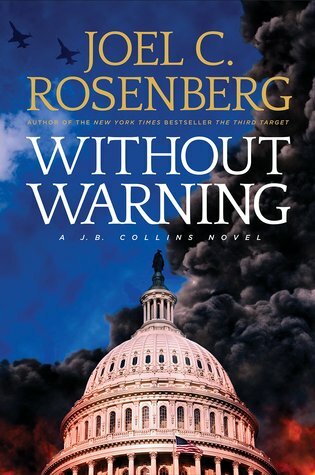 Without Warning is the third book in the political thriller series by Joel Rosenberg. Set in the modern day world, it follows the continuing saga of the US government as it refuses to step up and take seriously the threat of the current leader of ISIS. The main character, J.B. Collins, is a war correspondent for the NY Times and one with many connections of his own. As he has been present at other attacks against the US and other enemies of ISIS (including the kidnapping of the American president and another attack at a peace summit - occurring in the two previous books), he feels obligated to do what he can to help end the terror that ISIS is spreading. Using his many contacts, he joins a group of his own allies and sets out to bring down the terrorist regime. The action is non-stop and everything from the series is wrapped up at the end - just with a twist. As the last book in the series, it is one that definitely requires the first two to be read first (mainly because they are amazing but provide so much back-story). I have a love/hate relationship with the ending, but it was fitting and necessary - just not how I would have liked it to be. Rosenberg plays it out well, definitely not all sunshine and roses, but realistic, if anything. If you are a fan of political fiction (and even if you aren't), this book is one to add to your list. This is definitely a book outside my typical reading genre, but I have loved every one of Rosenberg's books. Overall though another solid thriller and I can't wait to see what future series will bring from Rosenberg - although sometimes the books are so close to life happenings I wonder how many more he will be able to write! Pick up a copy of Without Warning by Joel Rosenberg via Amazon (and grab the other two books as well!). Thanks to Tyndale House for allowing me a review copy of the book.